The Great East Japan Earthquake of 2011 was known the world over as the Fukushima disaster, named after the nuclear power plant that was heavily damaged by the earthquake and subsequent tsunami. 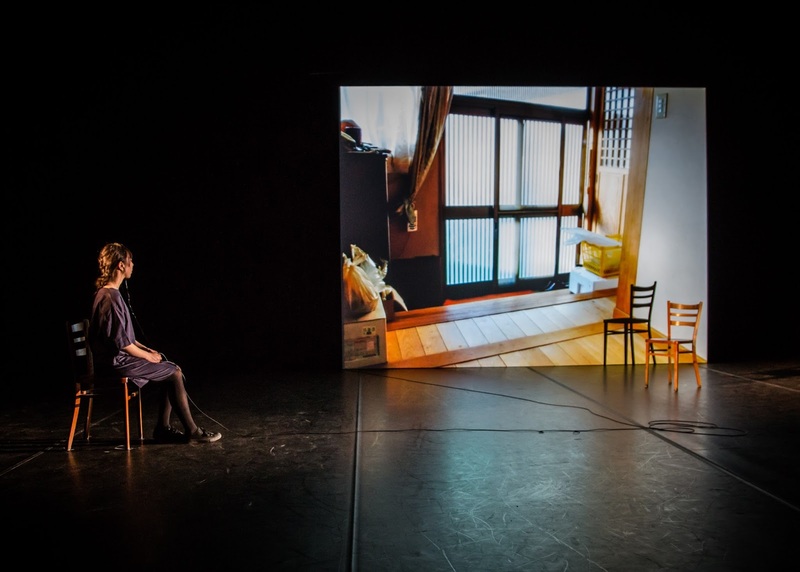 Kagerou, subtitled A Study in Translating Performance, focuses on the experiences of one woman, Kyoko, a survivor of the earthquake. Director and creator Shun Hamanaka has created a documentary experience, with performer Yoko Ito live-translating interviews conducted with Kyoko over the years since the tragedy. The original interviews with Kyoko form part of an aural soundscape, while we hear the performer tell the story in English. Translation is key to the performance; we are being brought into Kyoko’s world but are still held at a slight distance. We see projections of images filmed at Hisanohama; images that are mostly still but move just a little. It’s delicate and subtle, much like Ito’s performance – there are no bold moves or grand acting moments, just a reporting of one woman’s experience. Taking a large-scale tragedy that affected tens of thousands of people and focusing in on the experiences of one woman and one city is very effective. Kagerou recontextualises our experience of the Great East Japan Earthquake as a news report about a nuclear facility to a story of personal tragedy. Delicate and profound. The title of this show references “Little Emperor Syndrome” – the end-result of an entire generation of Chinese children born without siblings under the country’s One-Child Policy. It was created in collaboration between Australian playwright Lachlan Philpott and Beijing-based director, Wang Chong. In Little Emperors, there are two children: a son, who was kept secret, and a daughter, the oldest child. The son, Kai-wen, moves to Melbourne to become a theatre director, something his mother wouldn’t approve of. She also wouldn’t approve of his homosexuality either, so he keeps that secret for as long as he can. The show is not so much about a clash of cultures, at least until mother and daughter arrive in Melbourne to surprise Kai-wen, but an exploration of a relationship between two children – one of whom is kept at a distance because of the one-child policy. The script itself feels a little undercooked; Kai-wen’s story hits several clichéd beats about feeling at a remove from his family. His awkward relationship with one of his collaborators in Melbourne feels much less rich than the story explored between mother and daughter and, sometimes, between sister and brother. I wonder how this show would play in China and if my cultural sensibilities dulled some of the impact of the revelations late in the play. The direction and design is stunning, though – and the performances by Alice Qin and Diana Lin, as mother and daughter, brought a richness to the experience the rest of the show lacked. The actors perform much of the show thigh-deep in water and there are many moments of tension exorcised through vigorous splashing. Little Emperors explores an interesting subject but fails to be as compelling as it could be or should be.